GUANGZHOU - The Three Gorges reservoir is expected to face its biggest challenge since its operation, with a major flood brewing at the upper reaches of the Yangtze River, water authorities said on Sunday. The China Three Gorges Corporation forecast that floods as huge as those in 1998 will occur. The peak flow of the coming flood has been forecast at 70,000 cubic meters a second, greater than the 50,000 cubic meters a second during the flood in 1998, when 4,150 people were killed and 18.4 million residents evacuated. The Three Gorges navigation administration said on Saturday it will close ship locks if floods gush in at a speed of up to 45,000 cubic meters a second. At least 146 people have already been confirmed dead and 40 missing in 10 provinces and Chongqing municipality by Friday, after continuous rainstorms and floods in the areas since July 1, the Ministry of Civil Affairs said. Heavy rains have inflated water flow at both the mainstream and tributaries of the upper reaches of the Yangtze River, with inflow from the Minjiang, Tuojiang and Jialing rivers rising fast, said Wang Jun, director of the hydrology bureau under the Changjiang Water Resources Commission. Daily rainfall at the Jiuyuan monitoring station on the Jialing River hit 225 mm on Saturday. Inflow to the Cuntan monitoring station on the Yangtze River mainstream went up to 42,300 cubic meters a second at 3 pm on Sunday. Inflow to the Three Gorges reservoir will reach 53,000, 66,000 and 60,000 cubic meters a second at 8 am on Monday, Tuesday and Wednesday, respectively, the hydrology bureau forecast. With strong rains forecast along the Jinsha River on Thursday, inflow to the reservoir is also expected to approach 70,000 cubic meters a second. The Yangtze River flood control and drought relief office has been closely monitoring water in the river and adjusting the storage of the Three Gorges reservoir to help relieve mounting flood pressure along the middle and lower reaches of the Yangtze River, office director Wei Shanzhong said. Although the peak discharge at the upper reaches of the Yangtze River will surpass that in 1998, the duration and total flood volume will be less, the office said on Sunday. Flood pressure at the middle and upper reaches of the river should also lessen with control by the reservoir, it said. Still, Wei warned against water volume approaching or exceeding alert levels at monitoring stations such as those in Chenglingji, Jiujiang, Hankou and Datong at the river's middle and lower reaches. A number of dikes at the river's middle and lower reaches which have been under water pressure for a long time due to the continuous heavy rains are also susceptible to disaster, he said. The office of the State flood control and drought relief headquarters has ordered flood control and drought relief offices along the Yangtze to strengthen dam control, the China News Service reported. Sluicing at the Three Gorges Dam was also raised again on Saturday, from 32,000 cubic meters to 34,000 cubic meters, to save dam space for another round of rainfall coming in two or three days. About 38.216 million people have been affected and 1.315 million relocated in the inclement weather, Ministry of Civil Affairs showed. A total of 124,000 houses have also collapsed and another 327,000 damaged, with direct economic losses reported at 29.52 billion yuan, the ministry reported. 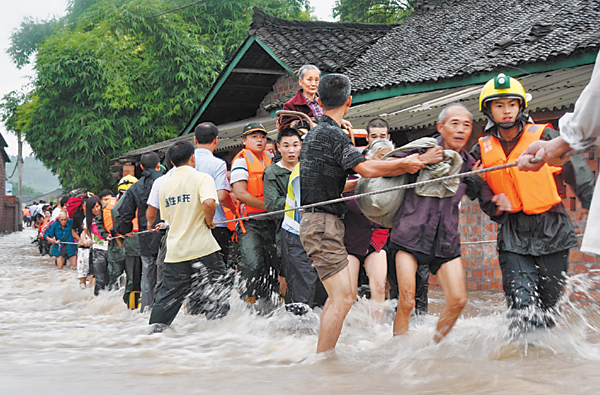 The central government has allocated about 370 million yuan in relief funds to nine southern provinces battered by floods on Friday. Typhoon Conson also made landfall in Hainan province at 7:50 pm on Friday, toppling trees and billboards and killing at least two people. It battered 68 towns and villages in eight cities and flattened 544 houses in Hainan, with direct economic losses estimated at 240 million yuan. Conson brought heavy rain to parts of Guangdong province and the Guangxi Zhuang autonomous region. It weakened into a tropical storm on Saturday and made a second landfall in northern Vietnam on Saturday night.